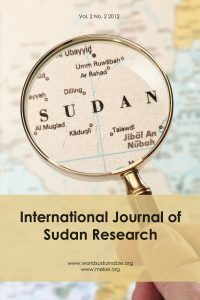 Purpose: The purpose of this paper is to develop agricultural and water management strategies to help poor traditional rain fed farmers to adapt climate change impact on agriculture in North Kordofan region in Sudan. Methodology: Historic climate data from the study area were collected and analyzed using CROPWAT model version 8.0. Reference Evapotranspiration (ETo), effective rainfall and irrigation requirements to develop different sowing dates strategys were also measured using CROPWAT model. Field visits observations and discussion with farmers also helped the author in results justifications. Findings: The study found that early sowing dates is better than late sowing in traditional rain fed sector in North Kordofan. Early sowing date secured water for almost 70 days of the crop cycle. Also under early sowing dates, soil moisture can maintain the crop at a later stage of growth. The paper investigated that drought tolerant Sesame crop replaced the millet crop for climate adaptation purposes in North Kordofan. Value: This research study is considered the first to develop agricultural and water management strategies to cope with climate change impact on traditional rain fed agriculture in North Kordofan, Sudan. The paper highlights innovations farmers are making to adjust to the changes they observe.